[Life] I'm Still Alive, Honestly. 1) I bought a house! This is a very nice two-story house within walking distance of Licton Springs Park, right by North Seattle Community College. I have a front yard and a back yard and a vegetable garden. Yay! 2) I have a second corgi. Claire's older sister Kayla (same parents, different litter) ended up orphaned when her people passed away. With no one left to take her in, the breeder took Kayla back to find her a new home. She's far more affectionate than Claire, and higher-energy, but also rather... we'll go with 'ditzier.' If I were the writer of Hyperbole and a Half, Kayla would be 'simple dog.' Where Claire has figured out primitive tool use, Kayla has issues figuring out the couch. 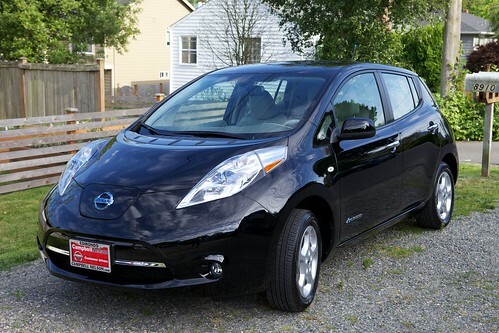 3) I have a new car; I went electric, and have a Nissan LEAF. Yes, I love it. Yes, the range is sufficient for what I do. Beyond that, yes, I'm still alive. That is all. Congratulations on the house, garden, new dog, and new car! I've heard good things about the LEAFs but haven't seen one myself. Even if none of this is news for those of us following in other venues, there's still something gratifying about an update here. What's the apparent panel in the nose of the Leaf? Is that a charger port, or is that back where an ordinary gas door would be? The front panel is the charging port door, yes; if I pop that open, there's a J1772 plug and a CHAdeMO plug both concealed under there. The majority of charging stations out there have the charger at the front of the parking space, hence why charging port doors tend to be on the front half of an EV rather than the rear half. Glad you're alive, and congratulations on the new house, dog, and car! I am now, on both my non-writer and writer Twitters. Thanks for your wonderful post. I really needed this. Thanks!